Striker Andre Gray feels there is no extra pressure on Burnley going into the derby. The Clarets are top of the Championship, ahead of Hull City’s game at Birmingham tonight, and Middlesbrough’s home game with Wolves tomorrow evening. Blackburn lie 25 points adrift of Sean Dyche’s men, neither in trouble at the bottom or realistically in play-off contention. Burnley are unbeaten in five games against the old rivals, but have’t beaten Rovers at Turf Moor since 1978, and Gray is looking forward to his second taste of the rivalry: “It was a great atmosphere there, I think it’s going to be even bigger this time around. “It’s going to be a tight game, it’s not going to be easy. They’re going to want to avenge the loss last time, but it’s down to us. “But we won’t feel any extra pressure. We are where we are in the league for a reason. “We’re an experienced team and we know how to deal with it. “It’s massive. No matter where they are in the league it’s going to be a massive game for them as it is for us. “It’s a derby so they’re going to be up for it the same way we are. 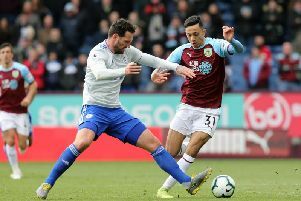 And Gray believes Burnley need to treat the game as any other: “We need to remember it’s a game we need to win, not because it’s a derby but because we need to stay on the winning trail and keep pulling away from the teams below us. “It’s obviously a massive game but we need to not let our emotions get in the way of it and treat it as another game and get the win. “Every game’s going to be difficult now. Everyone’s fighting for things. “Bolton are fighting for their lives and gave us a good run for our money and could have nicked it. “It’s the same with Blackburn, they’re not on the best of runs but come Saturday that doesn’t mean anything. And the Championship’s top-scorer has his eyes on the league title: “We don’t want to be just outside fighting for play-offs, we want promotion and the title. “But there’s a long, long way to go. We just need to dig in there and keep gritting our teeth and staying in games and trying to win games and the rest will take care of itself.